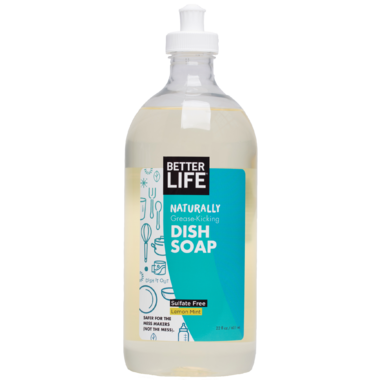 Better Life Dish Soap puts the hurt on grease without sulfates, keeping your hands happy. No need to wear gloves or other accessories – vitamin E and aloe will soothe and moisturize your hands. Discover how pure plant power equals easy rinsing without residue. DOES NOT CONTAIN: Sodium Lauryl/laureth sulfates, Triclosan Petrolum solvents, Parabens, Synthetic fragrances, Alcohol, Ethoxylates, Dyes. Directions: Squirt it on cookware, bakeware, cutlery, flatware, dinnerware, serveware, and other wares, except Delaware. Squirt onto your toughest, greasiest messes. Scrub. Rinse. Not for use in automatic dishwashers. Nice scent, works well! I have ordered several times and am happy to have a soap without harmful ingredients. This dishsoap has really good ingredients, and performs much better than what I had expected for a natural soap. I had been using Nature Clean for over a year, and I like this one much, much better. Will definitely be repurchasing!